For years I was on an Overdrive kick. I still kind of am. I love dirt pedals despite the fact that I don’t use them nearly as much as I used to, and am patiently waiting for my Timmy to arrive. 🙂 But ever since I went on my quest to get an original BOSS CE-2 chorus, I’ve kind of gotten on a chorus kick as well; not as bad as my overdrive kick, but every time I see a new chorus, I have to at least listen to it. And if I REALLY like it, I might just buy it. That’s how it was with my Homebrew THC. It just came along at the right place at the right time. 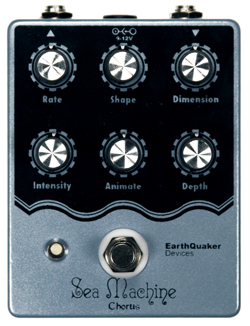 Dimension – which adds reverb/delay-like ambience to the tone. This is impressive because from demos I’ve seen, this pedal is capable of producing TONS of different tones from your traditional chorus to leslie to vibe to all-out tweaked! I totally dig Andy at ProGuitarShop.com’s demo as he demonstrates AND explains what the pedal can do, which is a lot. The Dimension feature is absolutely awesome! If I had to do it over again, and I hadn’t purchased the Homebrew THC, I probably would’ve picked up the Sea Machine. Great chorus! I’ve actually yet to play this. I fell in love with my Homebrew THC. I like the tweakability of this. Do you have any misgivings you’d care to share?